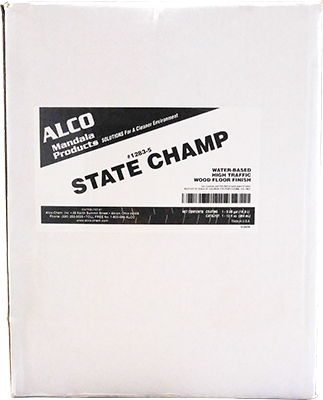 State Champ - Alco-Chem, Inc. This water-borne 100% urethane finish with catalyst is formulated specifically for high traffic wood floors. MFMA approved and VOC compliant. Covers 600-750 square feet per gallon, leaving a clear finish that remains unmatched in performance and durability. So strong it stands up to a warehouse forklift traffic! This fast drying finish dries in 2-3 hours and provides beautiful, high-gloss floors. Gym floors can be coated and ready for activities within 48 hours! For best results, use with G.F.C. Gym Floor Cleaner & Prime Kote Bonding Agent.